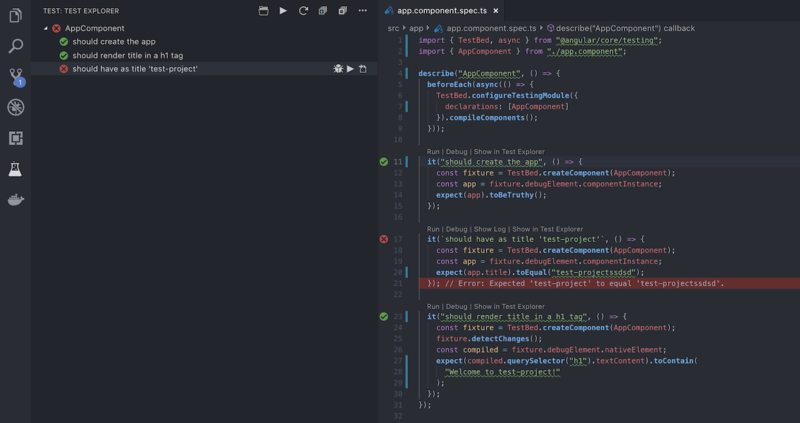 Visual Studio Code>Other>Angular/Karma Test ExplorerNew to Visual Studio Code? Get it now. The Angular/Karma Test Explorer extension that works with the Test Explorer UI extension. See all angular tests in the side bar without running them. Reload tests manually by the reload button in the UI. Run all tests together, run set of tests, run single test and see results in the UI. Loads values from user karma.conf.js (some get removed to make the explorer work correctly). Shows a failed test's log when the test is selected in the explorer. Restart VS Code and open the Test view. Run your tests using the icon. If a test failed click on it and you will see the fail information on vscode Test Explorer output channel. Detect file changes(workspace, test definitions or configuration) and reload tests automatically. Lets you choose test suites or individual tests in the explorer that should be run automatically after each file change. Adds CodeLenses to your test files for starting and debugging tests. Adds Gutter decorations to your test files showing the tests' state. Adds line decorations to the source line where a test failed. Forwards the console output from Karma to a VS Code output channel. This project is in early stages of development. If you find a bug or think that a feature is missing and is not in the backlog please report it. If you wanna help out please read the Contribution guidelines for this project file.